Brook Norwood (‘20) returns the ball in a singles match. 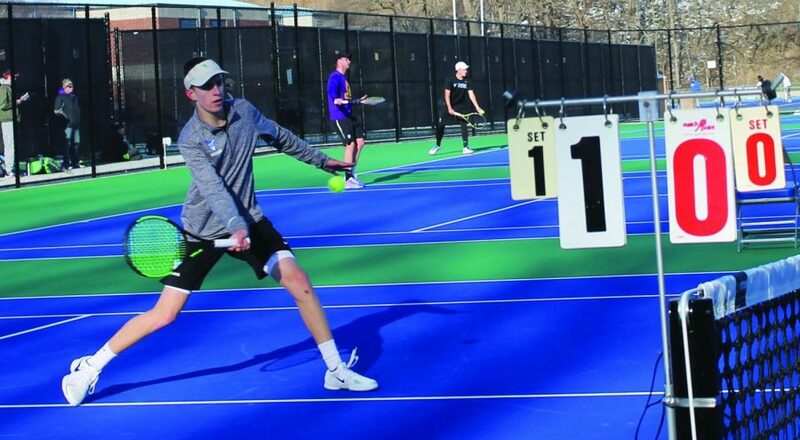 The Luther Men’s Tennis team defeated Loras College 8-1 in their first official home match of the season on April 17, bringing the Norse to 5-0 in the IIAC and 17-4 overall. Besides the difference in courts, Brian Murman (‘19) added that the outdoor play has additional factors that are absent indoors. Head Coach Adam Strand (‘04) expressed his contentment with the Men’s Tennis team, as Luther put together two new doubles pairs last minute due to scheduling conflicts. Despite this change, the new double pairs Jensen and Schneider won their match 8-3, and Karki and Morton won 8-1. Smith and Ryan Ortega (‘21) also won their respective matches, defeating Loras’ number two doubles pair 8-3. Furthermore, Luther won five of their six singles matches; with Schneider posting a (6-1, 6-4) victory, Jensen defeating Loras’ number three singles player (6-0, 6-0), and Murman winning (6-2, 6-3). Directly after the match the Luther Men’s Tennis team shifted its focus to their meet against Coe College on Saturday, April 21. Smith echoed this sentiment but remained optimistic. Luther lost at home to the number eight regionally ranked Coe 6-3, giving the Norse their first conference loss of the season.